This cottage is for the discerning traveller who wants to enjoy the real Tenerife...not the one created especially for the tourists! 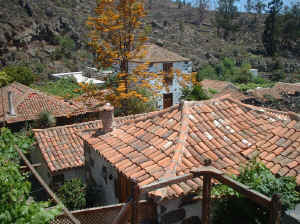 It is situated in the traditional village of Chirche, just 3 kilometres from Guia de Isora in South West Tenerife. A traditional, single storey dwelling lovingly restored to the highest standards, with wooden shuttered windows and doors. It has a private parking area and a vine covered pergola, which gives shade in the summer. 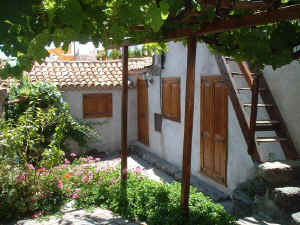 It also has a small roof terrace, which is reached by an original wooden outside staircase. From the terrace itself there are spectacular views of three of the other islands and the coast as well as the orange and lemon groves inland and the clay-tiled cottages of our near neighbours. The village is typical of the Canary Islands with narrow streets, picturesque houses and it's village square with pretty church. It is renowned for it's quality fruits which grow in abundance such as oranges, lemons, grapes etc. It is on the edge of the Teide National Park (just 3 minutes away) and has been designated an ecological area and as such the local council hope to preserve the existing old houses. The situation of this village makes it ideal for walkers and there are several chartered walks in this part of the island and the maps and information are generally in folders for your use in the cottages. The bedroom features a double bed and has adequate storage space. The living kitchen/dining room has French windows leading out to the patio with a garden table and chairs, a wood burning stove and a sofa bed, which can be used as an extra double bed. Satellite TV is now also available. The kitchen area has antique pine units with granite worktops and has a double electric hob, a separate small grill/oven and a washing machine. There is a separate fridge/freezer and an electric toaster and kettle as well as the usual cooking utensils and crockery. The bathroom is fully tiled and has a corner bath in white with antique pine panels, a shower attachment, a washbasin and w.c. Numerous charter flights from all regional airports which normally arrive in Tenerife on Tuesdays or Fridays. Chirche is approximately 3/4 hour drive from Reina Sofia Airport. Taxis are readily available. A hire car is essential for this cottage. The owner can arrange this on request for â‚¬140 per week. The car can be picked up and dropped back to the airport. Bed linen is also provided, as is electricity. Check in is from 3pm on the arrival day and guests are asked to vacate the cottage by 10am on the day of departure. There is a lovely restaurant in the village, about 10 minutes walk away, plus 2 more just up the road. Also within a short driving distance there are plenty of good typical restaurants and if you are looking for discos etc., the busy resorts of Las Americas and Los Cristianos are about half an hour away. There are no shops necessary in the village as all the local produce is delivered to the door, by the bread man, the fish man and the vegetable man etc. The large market town of Guia de Isora is 3 minutes by car and has large supermarkets, banks, chemists etc. plus the advantage of a 24 hour emergency medical centre. For couples with babies, there is a high chair available and a baby seat for the car (free of charge). Cots are available for a charge of 18 euros (subject to change). We ask for a deposit of 40% of the rental price, unless the booking is made less than 12 weeks before the start of the holiday, in which case the full booking fee is payable at the start of the holiday. Extra nights can be booked at a pro rata rate.